The lastet Opera 18 is the web browser based on the Chromium project which uses the WebKit/Blink layout engine. The all new Opera 18 has introduced innovative features including Speed Dial (Search the web or go directly to a webpage), Stash (Save pages for later) and Discover (Read recommended articles, Top-quality news and entertainment from a variety of categories). Faster browsing on slow networks with Off-Road mode: saves bandwidth and compresses data while you browse. It will speed up your browsing experience on slow network connections. Command the browser with mouse gestures: perform common browsing actions with quick, small mouse movements. Navigate faster with keyboard shortcuts: browse a lot faster using the advanced keyboard shortcuts. Note: Run launcher.exe to launch Opera Portable. 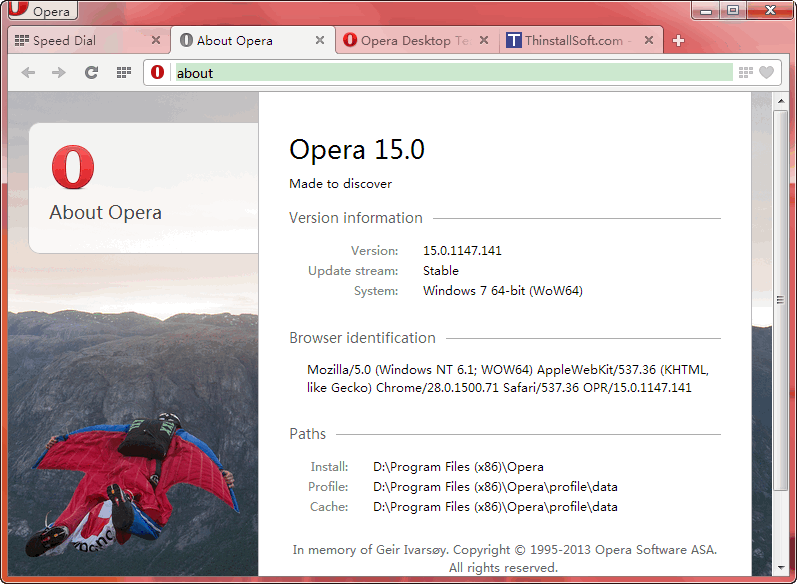 The current version is Opera 18.0.1284.68 which is based on Chromium 31.0.1650.63. All your data will saved into the profile folder. Opera 18 is the stable version of the Opera Next and Opera Developer. Opera Developer: A bleeding edge version, you can expect a lot of fancy stuff there; however, some nasty bugs might also appear from time to time. What's new in Opera 18.0.1284.68? This entry was posted in Internet Tools and tagged blink browser, browser, chromium, opera, opera 15, opera portable, web browser, webkit browser. Bookmark the permalink.